From Obama to Underwood — two of the most famous Presidents of the last decade. 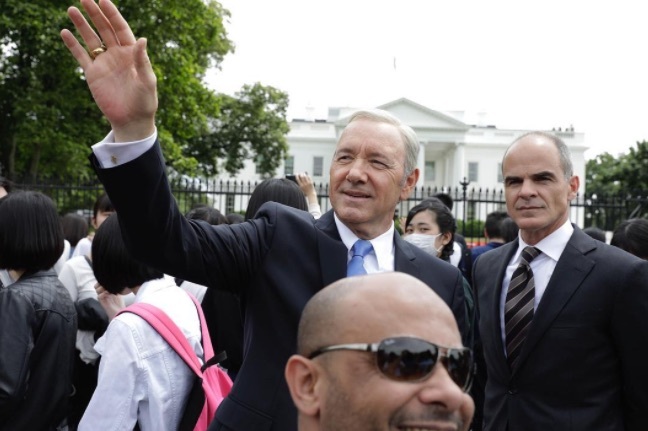 Okay, so we know Frank Underwood is a *fictional* character from Netflix’s House of Cards, but he got the presidential treatment when former White House photographer Pete Souza joined Underwood on the campaign trail. Since Souza is done with his White House photographer duties, he had time to join President Underwood and his Chief of Staff, Doug Stamper (played by Michael Kelly), on their recent visit to the area. They visited a few spots that you might recognize. Well, Frank certainly looks Presidential in these photos! But can he hold on to his position of power as his administration begins to crumble around him, and all sorts of lies start to spring to the surface! Crazy that this is all fiction! Check out all of the photos on Pete’s Instagram page — plus just a ton of other amazing pics. Wondering about the timing of all of this? Season 5 of House of Cards will be available for streaming on May 30th on Netflix.